Market dynamics and changing competitive equations prompt business, both small and big, to go for round-the-clock operations. However, 24/7 operations doesn’t work for all businesses. The decision to go for a 24/7 operation involves considering economic, strategic and long-term goals. Also, the decision may stand on a simple reason of being financially viable and profitable for the current period. While some businesses have the advantage of analyzing and deciding on what they need to do as far as 24/7 operations are concerned, some are bound by the compulsions of being in their respective lines of business or location. Thus, businesses near highways, airports or even manufacturing hubs find it almost essential to be open full time to make the situation beneficial for them. Many processes are required to operate continuously, especially in manufacturing, healthcare, hospitality and some retail industries. With the technological advancements driven competitive demands, 24/7 operation has become a necessity for many organizations looking for an advantage in the global marketplace. Thus, businesses working for customers in different time zones are bound to run 24/7 operations. Working in shifts is common in such organizations. The key motivation to go for 24/7 operations; remains profit. Other than that multiple factors are considered when deciding in favor or against going for round-the-clock operations. In cases where businesses may need to purchase heavy equipment and invest major capital to avoid running full time, full-time operations are preferred to save the hard cash. Some reasons for considering 24/7 operations are its ultimate benefits too. For example, increased utilization of capital investment, improvements in customer service, and sizable operational advantage, especially when labor costs do not matter much, are the benefits that crop up as reasons for choosing full time running. However, with benefits there are counter implications that need to be looked on. The challenges of running round-the-clock operations extend beyond the obvious. Employee fatigue is one of the most underestimated adverse effect of 24/7 operations. It has not only financial costs but also business costs in terms of increased errors, accidents, legal liability, turnover, healthcare costs, labor relations, and absenteeism. Generally, all such costs of human fatigue are not estimated in advance, which leads to budgetary failure. Organizations experienced in round-the-clock operations quantify these costs and include in their decision-making processes. Costs of reduced productivity, impaired quality, damaged equipment and increased scrap and rework are quantified and added to the estimates and budgetary provisions. Apart from this, staff training on physiological principles of alertness, sleep and fatigue is required. Other major challenges for the organization running 24/7 operations are creating a uniform culture, instilling common values across all shifts, and implementing common operating standard. Issues can emerge on the front of employee morale, operational safety, productivity, and quality control because of variation in management, training, employee motivation and culture. Some technical but serious issues also crop up due to 24/7 working. Some of these are pay issues because of confusion in definition of workday for each shift and calculations about overtime. To overcome such issues, technology becomes the backbone of the solution chosen. In such cases, technology support is most essential as a 24/7 operation does not have downtime. Innumerous situations and scenarios can make it highly confusing to calculate extra pay, shift pay, or holiday pay. It is important to resolve pay issues quickly and effectively. Thus, various custom time and attendance systems are used after making them compatible with the requirements. There is a lot that comes with the running of 24/7 operations, and there goes a lot to make the operations happen. For an objective mind, it goes like running parallel businesses that are management back to back. 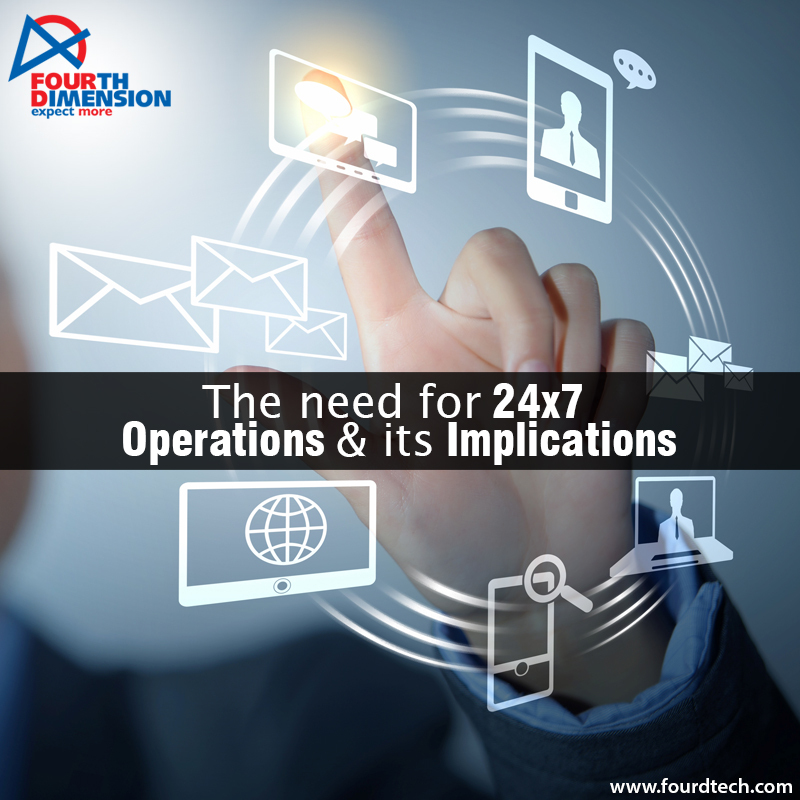 With an expertise of over 25 years, Fourth Dimension Technologies has emerged as a noteworthy specialist delivering distinguished 24/7 support to its clients across the globe. Our facility is staffed round the clock by seasoned support experts with extensive experience across a broad range of technologies and equipment vendors. Leveraging best practices including ITIL advanced service automation capabilities and intelligent monitoring and management tools, our services allow you to ANTICIPATE, IDENTIFY & RESOLVE system issues more quickly and with greater accuracy while maintaining the price competitiveness and control over your operations. Thus, you get an improved SLA through reduced cost and increased processes efficiency. Let us take care of your IT fort while you focus on your core business objectives.